Marshall Electronics V-MD173 - Fiber Group Inc. The V-MD173 is part of Marshall Electronics’ extensive MD series of rack mount monitors. MD Series monitors offer a flexible modular solution to system integration. 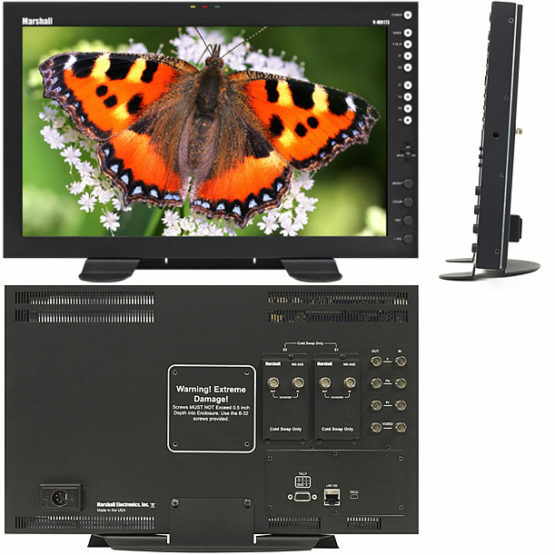 These rack-mountable monitors can be configured with a variety of video inputs that can be “swapped” or interchanged in the field based on your evolving needs and requirements. This eliminates the need to upgrade or replace equipment when a different input or application is required. This “future proof” solution provides flexibility and reassurance when necessary, especially in multi-monitor rack mount units. The V-MD173 can be mounted in any standard EIA 19″ equipment rack. The attached rack ears can be angled to provide the user control over the viewing angle. A VESA standard 75mm hole pattern also allows custom mounting installations. Alternately, the V-MD173 can be used in a desktop configuration with optional stand (Marshall part number V-ST15).